Of course I must share when I find a fabulous thrift-sto’ find! 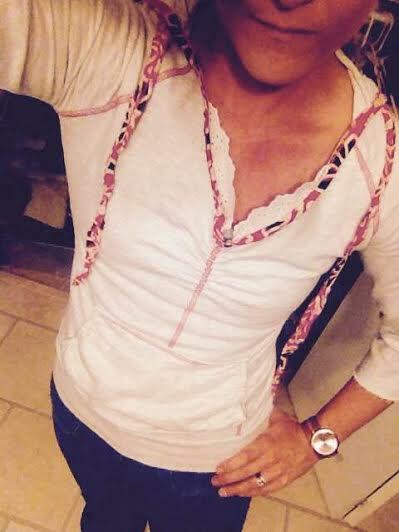 This hoodie is a recent favorite: A brand and style I’m obsessed with. FREE PEOPLE. I’m not a ‘brand’ person. Meaning: I could truly care less what the brand name is as long as I like the style. However, my main exception is Free People because, well, I love every single thing they offer. And, when I stumble across something of theirs second-hand, it’s mine! Mainly because it’s always adorable and I could never afford or be willing to pay their prices for their stuff. The Shopping Pause is something that I have had to practice and learn over time in my simplifying journey. I like to think of it as smart, intentional, frugal, and fun. I have always been an impulse decision maker – and my shopping habits reflected that. It resulted in over-crowed closets, unhappiness in my wardrobe, buyers remorse, and debt. Now, I shop for discounted items and second-hand. This type of shopping took a while to get the hang of, but is perfect for my new lifestyle. Today, I was on the hunt for a new pair of blue jeans. My current pair had a button that broke off and was not fixable. I wear blue jeans all the time and knew this was something that I needed back in my wardrobe. So, I shopped online at Target and found a pair of blue jeans on clearance! Yay! It was only $10.00 so I thought, no harm done. Well, then Target required a $25 checkout for free shipping. So I spent over an hour trying to find enough things I ‘need’ to make up for the shipping cost. My cart was upped to $28 just so I could get enough ‘stuff’ for my true mission which was originally one pair of discounted jeans. I decided to use the Shopping Pause before checking out and getting the carted items. I let my account just sit until my lunchbreak without buying. Then, I went up the road to a local thrift store. I told myself, that if I didn’t find a pair of jeans there, I would checkout my Target order when I got back. On the way to the thrift shop, I realized just how pissed I am at Target anyway. I am currently trying to pay off my credit card and they charged me an interest fee of $25 just this past month. TWENTY-FIVE DOLLARS out of the $30 I paid went to interest. Fuming about that, but also excited to hunt down a new pair of jeans at the thrift store, I searched through the rack. 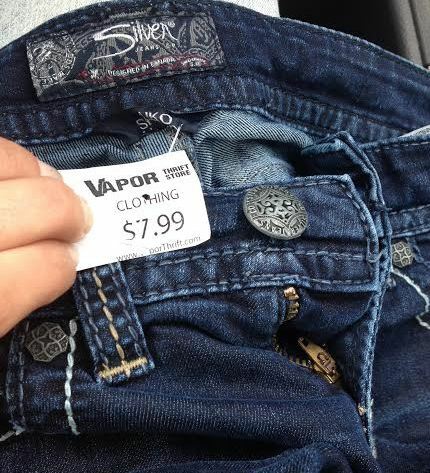 In all of about 5 minutes I found a new pair of Silver Jeans for $7.99. I tried them on and they fit perfectly and had zero flaws. These bad-boys are $85 brand new at Buckle. Needless to say, I checked out very happy and even more happy that I paused before rushing my order and getting items that I truly didn’t need. Shopping second-hand is the number one way that I am paying off debt quickly and also fulfilling my capsule wardrobe. I like my stuff smart, simple, stylish, and nice – and I intend to keep it that way! I’ve been on a roll second-hand shopping lately. Since I decided to begin with a fresh slate with my capsule wardrobe, I have only included second-hand items in my recreation. All the clothing that no longer serves me or fits properly is gone. I am treading that fine line between saving money, but also creating a capsule that suits my every day life and style. 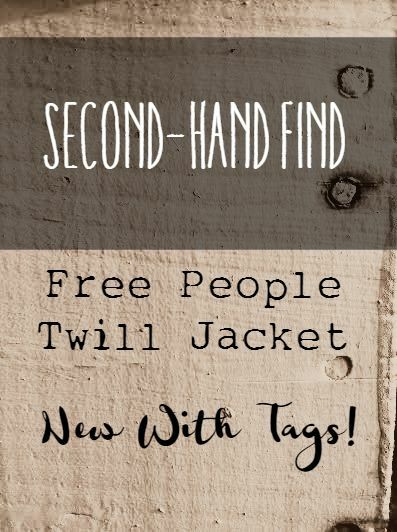 A new-with-the-tags Free People twill jacket! I’m obsessed with Free People clothing, except I can not afford it, nor will I pay out-of-pocket full price for new. That’s why I am super stoked to score this brand new soft, twill coat for winter. It fits like a glove, looks adorable, and is really warm. Some poor soul paid $168ish, and I scored it for $19.99. 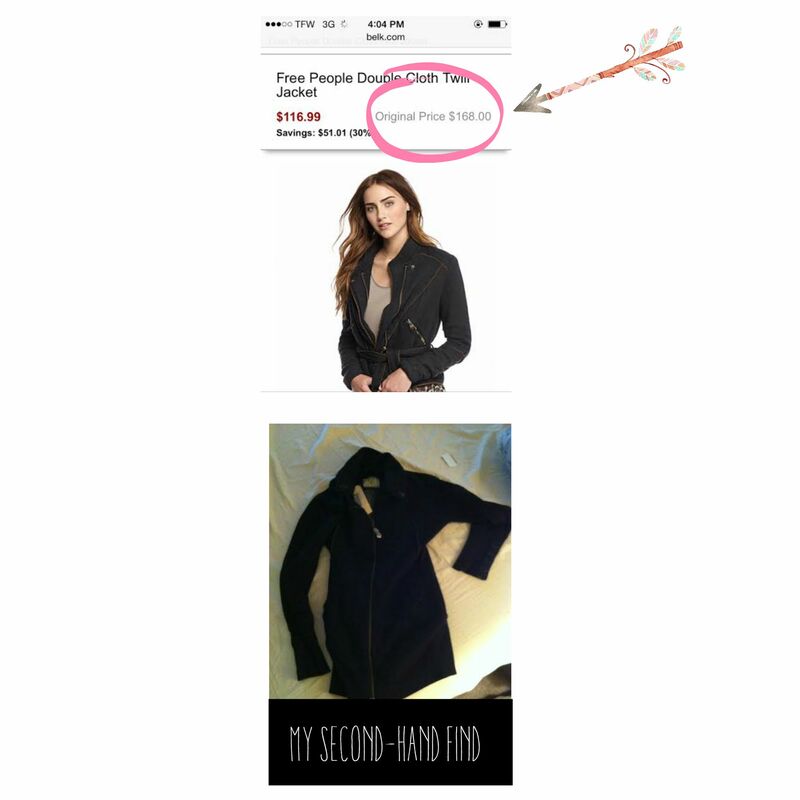 That’s a win in my book – great price, perfect fit, and suitable as my capsule winter coat. Human beings are hunters and gatherers. Although we have a lot of luxuries, and conveniences now, that primal instinct seems to flair every now and again. We have a true need to compete, mark territory, gather, store, and stock up. But, there is a fine line between enjoying what you need and going overboard. My focus is simplifying my life. I spent the last decade climbing the corporate ladder, acquiring, and following the American Dream only to find that true happiness is not found that way. It’s the undoing of excess and focusing on the important things in life that is bringing me pure joy. There are times, of course, that I need to acquire something new. But, I don’t want to break the bank because I am also paying off debt and spending less. My definition of minimalism isn’t doing without or counting items so much as it is about clearing the unnecessary to make room for importance. This brings me to shopping second-hand for new items that I need or for things that I need to replace in my current stash. The reasons that I love shopping second-hand are pretty much endless, but I have a few reasons that make me passionate about turning someone else’s trash into my treasure. Second Chance Life: It is a beautiful thing knowing that an item someone else discarded can be used by me! I can bring that item to life again in a new and different way. 2. Saving Money: Purchasing something new from a store is going to have one hellacious mark-up price. 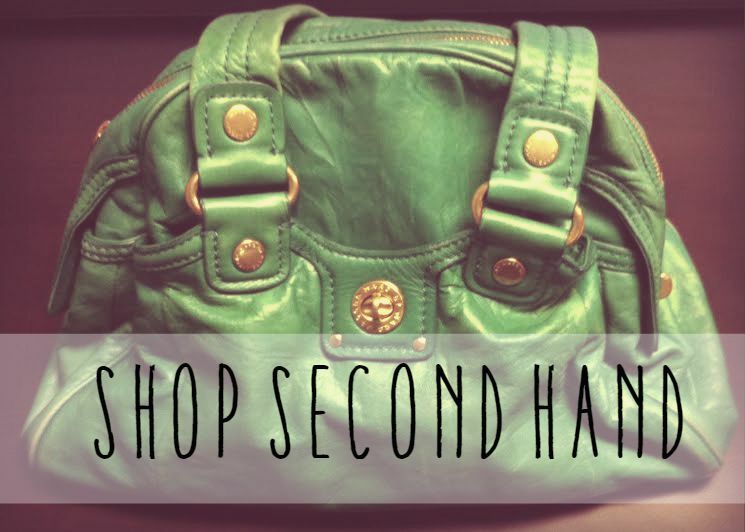 Buying second hand is a severely discounted price for a used item. 3. Environmentally Friendly: A thrifted item can be saved from the landfill. We can choose to use what is already in circulation over something new. 4. Creativity: Second-hand items are a great way to explore style and fashion for less. 5. Charity: A lot of thrift shops donate to help the greater good. 6. Working Conditions: Just because you buy something from a clean, well-lit, fancy store doesn’t mean that the item came from that same environment. Sheltering yourself from the truth doesn’t mean it is OK.
A Marc Jacobs purse! Some poor soul paid full retail price for this, which was around $400.00. I scored it for $3.99. It’s super cute and has a lot of life left in it. It is replacing my old, broken Fossil purse that I have been using the last few years. This Marc Jacobs purse is mine to now use up to it’s fullest potential. While I am not completely against buying new, I do feel it’s important to shop smart for yourself, buying only what you need in the greatest of quality possible for the least amount of cost and heartache.